This product is available in Flipkart, Tatacliq, Amazon.in. At flipkart.com you can purchase Canon EOS 200D DSLR Camera Body with Single Lens: EF-S18-55 IS STM (16 GB SD Card + Camera Bag)(Black) for only Rs. 38,990, which is 10% less than the cost in Amazon.in (Rs. 43,400). The lowest price of Canon EOS 200D 24.2MP Digital SLR Camera + EF-S 18-55mm f4 IS STM Lens was obtained on April 24, 2019 5:39 pm. 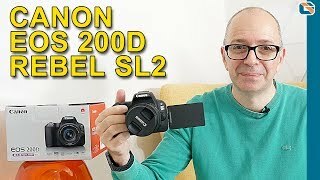 Canon EOS 200D review: The perfect mini DSLR for beginners? 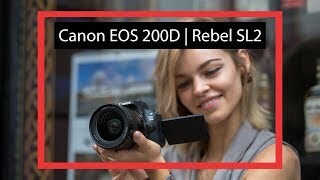 Note:-Canon camera body does not have in body image stabilization, canon provides image stabilization through lens and camera body depends on lenses for image stabilization, if lens does not support image stabilization camera will not be able to stabilize.Canon 200d is one of the smallest dslr out there this improves upon its older variant 100d.It packs serious upgrades, first sensor is change and is now have dual pixel sensor, similar auto focus mechanism has been changed, internal processor is now digic7, video recording capacity has been upgraded too.Pros:-1080/60p video captureMicrophone input jack for external microphone for better audio recording24MP sensor with Dual Pixel AF right now only canon is offering this. Good image quality considering this sensor is used in almost all higher end apc camera.3″ fully-articulating touchscreen LCDDual pixel Phase-detect Auto Focus System5 fps continuous shootingDigic 7 processorAccurate Auto Focus in both photo and videoResponsive touchscreen and interfaceVery good video and image stabilizationWi-Fi,Bluetooth,NFC that can be used for image transfer and as remote control.Light weight.Decent battery life.Easy to use, easy to use auto mode.Easy to use interface.Made for starter, casual shooter and beginners.Cons9-point center cross auto focus system which is old considering price and other canon line upsPlastic build quality of bodyLags behind in dynamic rangeNo 4K video recordingBundled lens kit is just average.Suggestion:-Try local markets, you might be able to get the product for cheaper price.Get a prime lense preferably 35mm or 50mm for best image and videos.Verdict:-Canon 200 is serious entry level dslr which quietly sits below 800d. 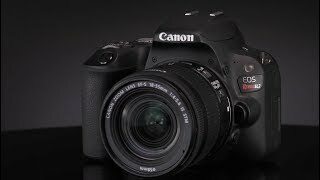 It is decent upgrade from 750d, 100d and offers great features and functionality. It offers the all the functionality of 800d at fraction of its price. The real shortcoming is that it does not support 4k video, other wise it would have been a perfect DSLR. Nonetheless if is good and a recommended camera.I hope my review has been helpful to you. If you have any question feel free to message me or comment down below. I shall be glad to assist you.